John P. Vincent, Ph.D., ABPP, received his doctorate in clinical psychology from the University of Oregon. In addition to being a licensed psychologist and licensed marriage and family therapist, Dr. Vincent is board certified in clinical psychology by the American Board of Professional Psychology. Dr. Vincent is a university professor who conducts research, authors professional publications and supervisors doctoral students in clinical psychology. In 1997 he was recognized for his dedication to victims' rights by the U.S. Department of Justice Office for Victims of Crime. 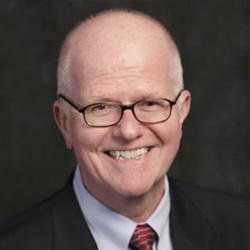 He has edited a five volume series, Advances in Family Intervention, Assessment and Theory and a book entitled Domestic Violence: Research Informed Practice Guidelines (with Dr. E. N. Jouriles), served on the editorial boards of numerous professional journals, and has authored over 200 research articles, book chapters, and conference presentations. He has received 30 research grants from private, state, and federal agencies. In addition to his research activities and practice in clinical and forensic psychology, Dr. Vincent has served as an expert witness in State and Federal Court. He also has served as a consultant to major law firms, corporations and governmental organizations. His clinical practice focuses on work with children and adults around issues of emotional regulation (anxiety, depression, anger and trauma). He also works with couples, families and organizations around communication, management of conflict, and resolution of specific problem areas. Dr. Vincent has been married for 34 years and has two children. For issues that may fall outside Dr. Vincent's expertise, he maintains a network of well-qualified mental health professionals to whom he can refer. Dr. Vincent’s approach to marital therapy begins with a thorough assessment of the individual and couple’s strengths and areas of difficulty. While his emphasis is on current and future life circumstances, understanding the role of one’s family history and life development is often important in laying the foundation for self-awareness and change. Drawing upon the information obtained through this initial assessment, Dr. Vincent works with clients to identify concrete goals for treatment. Once treatment goals have been identified, Dr. Vincent draws upon the latest evidence based treatment approaches to formulate a plan for addressing those goals and shore up the individuals’ and couple’s adaptive resources. Ongoing assessment of treatment goals permits evaluation of progress and identification of any new goals that may emerge.